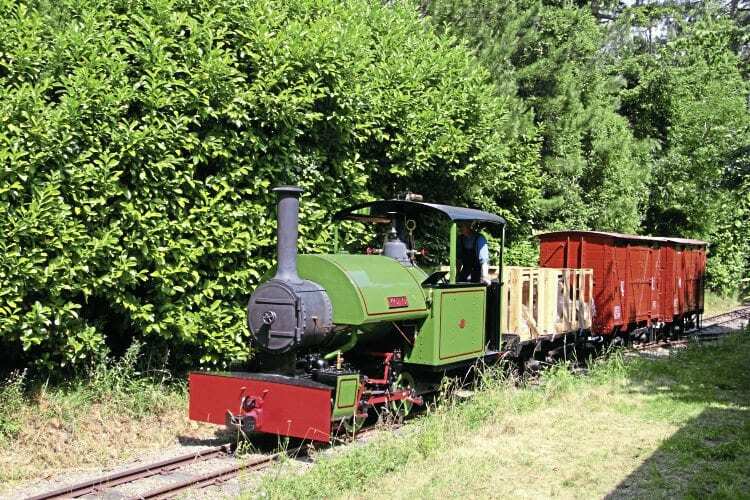 THE Darjeeling Himalayan Railway Society celebrated its 20th anniversary with a steam event at Adrian Shooter’s private Beeches Light Railway on July 1. Mr Shooter’s Darjeeling Himalayan Railway (DHR) Sharp, Stewart B-Class 0-4-0STT (3518/1888) No. 19 hauled a passenger train, comprising two replica DHR coaches, and his replica Scindia State Railway carriage, plus two visiting locos were also in steam. Bagnall 0-4-0ST Woto worked a train of replicated DHR goods stock, while Baguley 0-4-0T Rishra steamed back and forth along the station loop line; a wheel profile incompatibility with the station turnouts preventing running on the main line circuit.